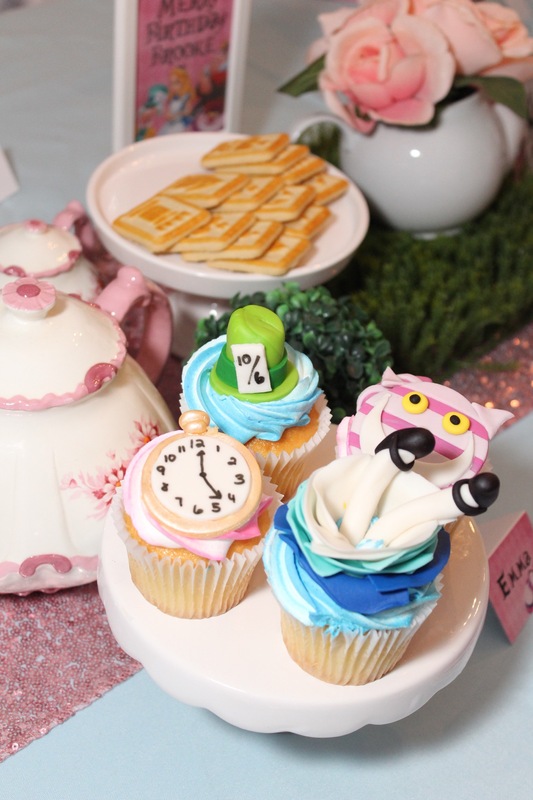 Follow us down the rabbit hole for a whimsical Alice in Wonderland themed tea party! Guests enjoyed hair, makeup and mini manicures at the Queen of Hearts Beauty Station. 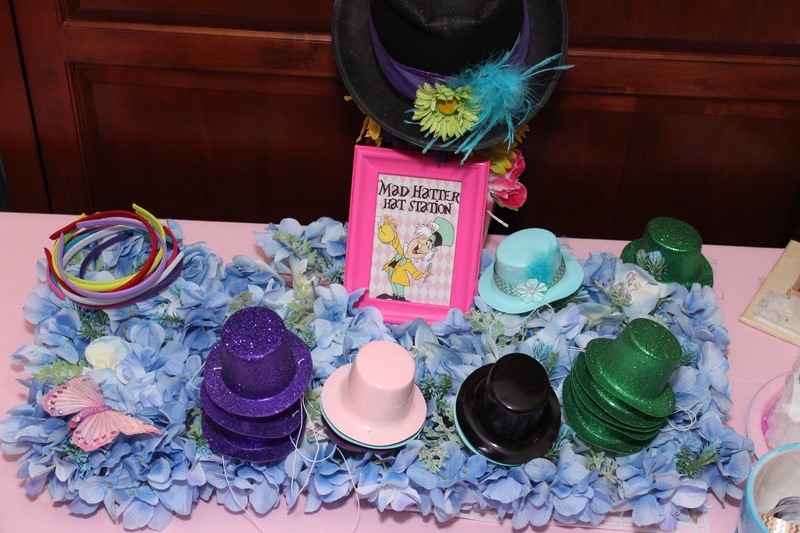 They also mad custom hats to wear for the party at our Mad Hatter craft table. The highlight of any party is the moment the characters arrive. Alice was delightful and the Queen of Hearts was tolerable with her sarcastic and witty persona. The table decor was colorful and fun including bright flowers and greenery. Using real linens and real china gives all of our tea parties an authentic and classy look. Guests enjoyed fresh fruit, mini tea sandwiches, chess cookies and petit fours during our tea party. The cupcakes were whimsical and perfectly on theme. We finished the party with story time by Alice and photos for each guest on our colorful picture backdrop with fun props and Polaroid pictures for the birthday girl to keep. Spring is upon us! If your child has a springtime birthday, check out these Spring birthday party themes and get inspired to plan something SPECTACULAR! Nothing says spring like a beautiful fairy themed tea party. Lovely spring flowers, green and pink fairy decor and a visit from Tinkerbell or the Garden Fairy make this the perfect spring themed birthday party. This adorable spring birthday party theme is bright, cheery and perfect for a backyard birthday bash. Guests can enjoy themed candy buffet treats and take home gumball memory orb necklaces. The emoticon photo booth is extra fun and perfect for tweens! As the weather warms up, it’s time to go ‘Under the Sea’ for a party like no other. The Little Mermaid is a fan favorite and provides a FINtastic theme for kids of all ages. Avast ye scurvy scalleywags! A pirate themed party is the perfect way to kick off spring. Take the party outside and make guests walk the plank or enjoy a backyard obstacle course. Ready to book your child’s birthday party? Click BOOK NOW for availability and let us make your party SPECTACULAR! We loved having the opportunity to craft this bright and cheery themed Inside Out Birthday Party Bright colors were an absolute must, as well as a yummy candy buffet, aka ‘Bing Bong Tears’ for guests to enjoy. All guests enjoyed Inside Out tattoos, faceprinting and a gumball necklace (Memory Orb) craft. The birthday girl was extremely surprise when our Disgust and Joy inspired characters arrived. What a JOY to plan this fun and unique party. Oohlala a day at the Diva Spa! Beautifully decorated in pink and purple with accents of silver, this Spa Party was so much fun! Guests enjoyed all natural facials, hair, make-up, mini-manicures, karaoke, glitter tattoos and a photo booth filled with tons of fun props! 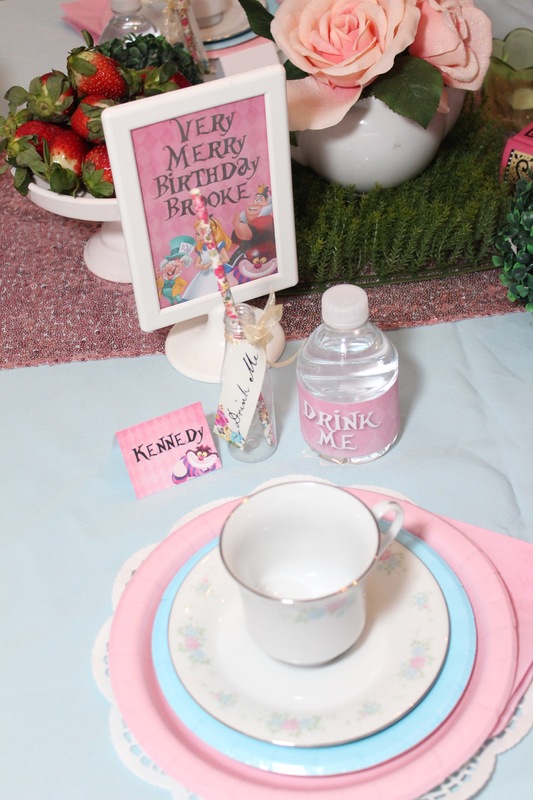 Girly-Girl Partea’s specializes in fully customizable themed birthday party planning with everything from food and decor to exclusively designed party printables. Our talented girly-girl hostess staff runs every step of the party from set-up to clean up and everything in between. You invite the guests and we’ll do the rest. Contact us today to start planning your spa birthday party. 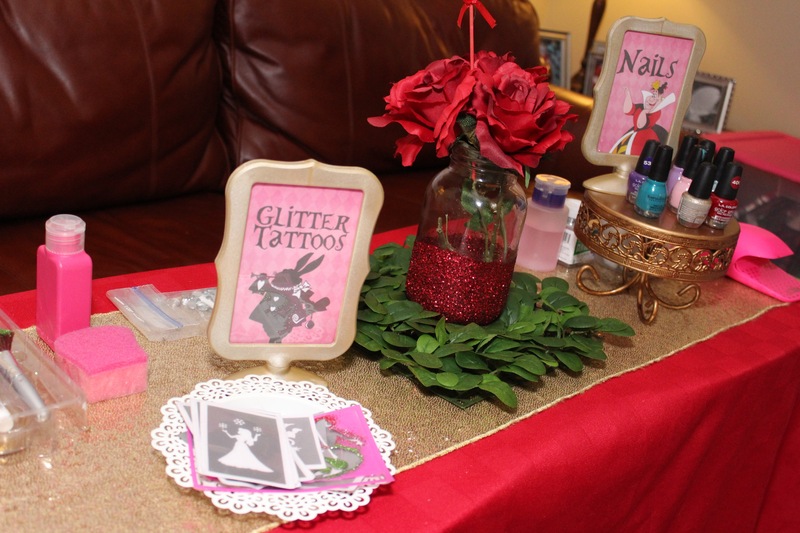 This breakfast themed party started with mini-manicures, glitter tattoos and a fun Christmas ornament craft. Shortly after, our surprise guests arrived, Elves from the North Pole! Joy and Jingle brought a special gift for the birthday girl and sat down to read a Christmas story. All guests were then served breakfast themed foods including hot chocolate, cereal, mini pancakes, fresh cut fruit and powdered donuts. After brunch was served, our elves passed out blank sheets of paper and pencils so each guest could write a letter of last minute requests to Santa. All guests then enjoyed decorating yummy sugar cookies and took pictures with the elves before they had to depart for last minute Christmas preparations. What a fun way to celebrate the holidays and a birthday all in one party! This High Noon Tea party was simply splendid! We provided hats adorned with flowers, elegant gloves and costume pearls for guests to wear for the party. Guests enjoyed mini-manicures, hands-on craft (an adorable bead bracelet), light make-up and tea party themed games (our favorite). Mood setting classical background music and elegant decor, including fine china and spectacular table scape, provided for a truly delightful event. Included mini tea party sandwiches, tea in a variety of flavors, petit fours, cookies, fresh fruit, delicious cupcakes, custom labeled water bottles and customized name cards. 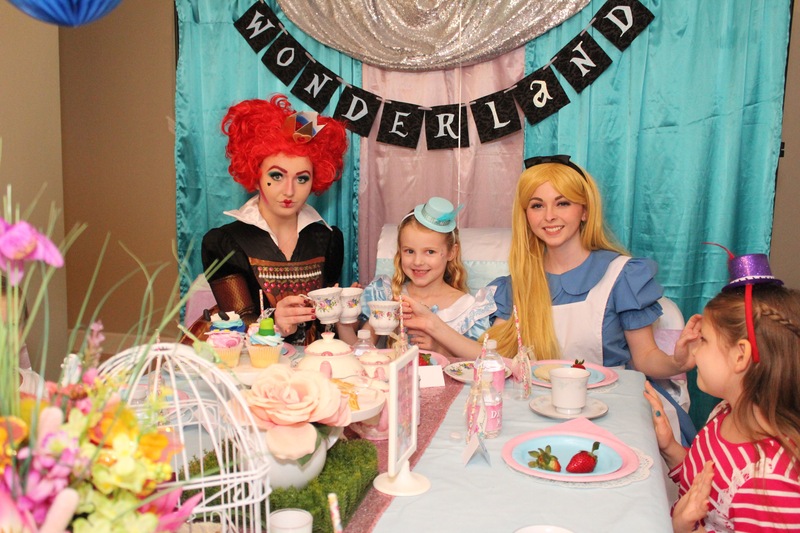 This adorable Tinkerbell themed tea party was absolutely magical! Guests arrived and dressed in tutus and fairy wings. They went through stations with our talented hostess staff for make-up, hair with take-home tiara, mini-manicures and themed tattoos. With plenty of glitter to spare! While waiting for their ‘special guest’ to arrive, the little fairies made wands with fun stickers and press on jewels. Finally the time came for Tinkerbell to make her appearance. She brought birthday gifts for the two birthday girls. After meeting the oohs and ahhs of all the little guests she read a wonderfully adventurous story and then sat down for a tea party with the kids. Everyone enjoyed REAL china, a beautiful fairy themed tablescape and appropriately themed food before singing happy birthday. The magical party ended with group pictures with Tinkerbell including a magical “pixie dust” throwing picture. How fun!